Drivers in Paris, be aware, you can now be fined for blocking traffic at busy intersections - and the capital's cameras are watching. Motorists who enter a crossroads when their exit is blocked now face a fine of €90 if they are caught on camera. France's Highway Code clearly states that the offence of causing 'congestion at intersections', by driving into an intersection and obstructing traffiic' is an offence punishable by a fine - but authorities have rarely clamped down on this particular road traffic law infringement. According to the rules, the last motorist to enter a busy junction and block traffic is the one that will face the fine, as that will be the vehicle deemed to have caused the blockage. 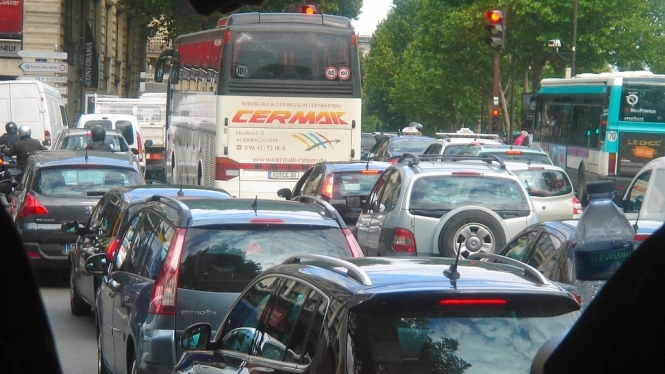 Paris police prefect, Michel Delpuech, told Le Parisien that these traffic jams caused by this form of inconsiderate driving behaviour, "contribute to the traffic jam and penalise public transport. "Consequently, this offence will be reported, as from Wednesday, 13 February".